Did you hear Baltimore: The Rise of Charm City today? 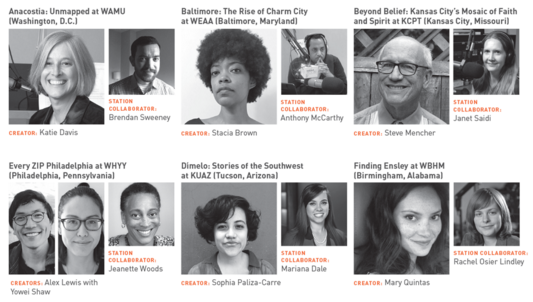 Last month, I wrote a post about my new job as an independent radio producer on “Baltimore: The Rise of Charm City,” a new half-hour audio documentary funded by AIR with additional support from the Corporation for Public Broadcast as part of Localore: Finding America, a 15-city hyper-local storytelling project. Today, our first episode premiered on WEAA 88.9 FM. You can hear it here: http://weaa.org/post/episode-one-keep-shaking-and-baking. I’ve definitely done that. I’ve got Ali Post, a field producer who’s a quick thinker, a troubleshooter, a fire extinguisher, an astute story collaborator, and a sounding board. I’ve got Mawish Raza, who exudes calm under ridiculous deadlines, makes magic out of photographs and video footage, and has already lost sleep ensuring that we had our show packaged for today’s 11:30am start time. And I have Marsha Jews, who knows Baltimore’s black history and exactly who we need to talk to about it, who is a voice of reason when I’m quietly freaking out, and who gets things done. Period. Fast. And of course, it must be said: none of us would be able to do any of this important work without our grant from AIR. Funding makes all the difference in the scope of the narrative work you can do. So many people are already telling Baltimore’s important stories in various media on next to no budget. We’re honored to join their ranks — and very fortunate to be doing it with some financial backing. Strong team, strong show. Well, wait. We’ll let you be the judge of its strength, listeners. Let me know what you think after you’ve heard it! In the meantime, here’s our video trailer for Episode 1, which I didn’t get to share here in advance of the show, because: mile-long to-do list.